Ace fire rated partition walls are the fire rated partition system installed at site using Ace Panel Seals with pressed steel channel encasing and reinforced by suitable structural steel support sections. The support sections can be standard steel angles , channels or beams depending upon the span of unsupported width and height of the fire rated partition wall required to be installed at the location under consideration at project site. Ace Panel Seals are Mineral Wool Boards of nominal density 150 kg/m3 coated on both the faces with Ace Mastik Coatingto a nominal thickness of 1.0 mm. Ace Panel seals are arranged and fixed at the site location to be encased in steel channels on all edges. The support sections and steel encasing channels are also coated with Ace Mastik Coating to a nominal thickness of 1.0 mm . 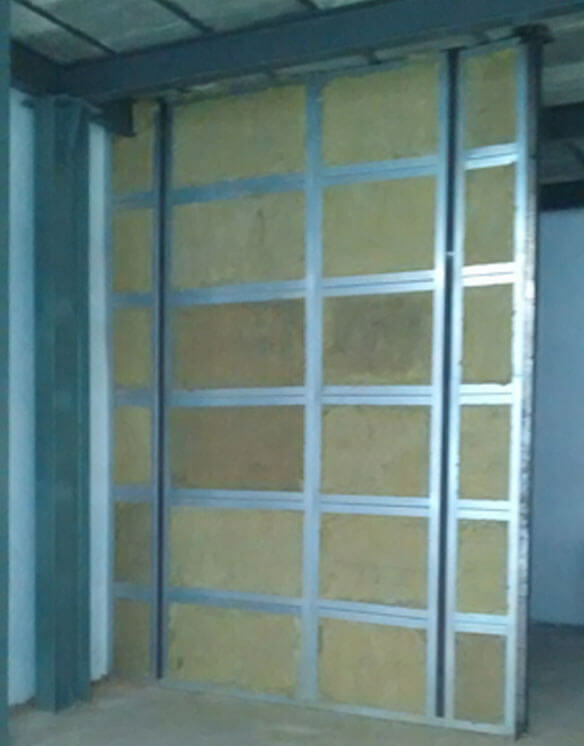 Ace Fire rated partition prevents spread of fire, smoke and noxious gasses across the partition in the event of fire, when installed in accordance with the installation procedure. The product is tested as per BS 476 Part 22 and IS 3614 Part 2. Standard fire rating of the system in up to 2 Hrs. Special arrangement and system designs can be be offered for systems upto 4 hrs fire rating. Can be repaired and altered in future to accommodate changes due to upgradation in operations and other accommodating factors at the given location. Added advantage of good acoustic insulation./ sound attenuation. Flexible to moderate shocks, temperature variations and weather conditions. Support steel sections and encasing Supporting structure size and thickness depends on span of partition width and height . Encasing steel channels are nominal size 50 mm x25 mm x 0.8 mm thk GI sheet.